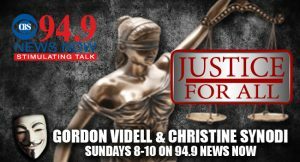 Listen to Justice For All with Gordon Videl and Christine Synodi every Sunday from 8:00-10:00a.m. on 94.9 News Now and Stimulating Talk! !